All small business owners have a reason they take the leap and hang out their shingle. When that reason sustains a business for 29 years, you know it has to be valid. In this case, it was also personal. As a social studies teacher, Rex Nichols supplemented his income by selling life insurance and he really enjoyed that. By 1995, he wanted something more. He sought a greater satisfaction by helping somebody. So, he rented an office at 16 S. Indiana in downtown Mooresville, leased a desk, bought a file cabinet, put in a phone line and started making calls to sell life insurance full-time. Getting the satisfaction of helping somebody is bittersweet to Rex, but has become an even stronger purpose through the years. He said, “I dreaded taking that (life insurance) check to the survivor. It’s not something you want to do, but you are glad you can do it. That’s a time of need and presenting that check shows that we helped them do something that is going to help them go forward. The family is crushed and heartbroken most of the time, but they can continue their lives and have time to grieve. (Insurance allows) families some time to get through the period and begin to rebuild and move forward. “It was scary when I quit teaching,” Rex said. “I wasn’t making much. But the Monrovia community where I taught showed their faith in me and supported me.” Just over a year later in the fall of 1996, Nichols pounced on the opportunity to buy the building housing 31 S. Indiana. He says he thought the main street location would give his business lots of visibility and it was a bigger opportunity to grow. His thriving business is evidence of a good decision. For the first six years, Rex was the sole member of the agency and he says he kept hustling to write policies. Then he hired Terri Speck as a customer service representative. After 23 years, she still serves agency clients and was joined by several other employees including Lori Pridemore, Francy Bain and Janet Arthur. Growth steadily continued as Kirk Witt, David Nichols and Mike Nichols came on board. As they each became more experienced, the business really took off. Rex says he is not handy at all. “I can’t build or fix anything,” Rex said. “The only thing I have ever built in my whole life is this insurance agency.” After 29 years his business is still flourishing. He says the best step he ever took was hiring agents to grow. And the building and growth of his business continues. “I mull decisions over,” Rex said. “Every time we get to a point, I ask, ‘Do I hire another person or stay where I am?’ Every hire is a risk. It’s a commitment and it has to be a feasible opportunity for them. It takes time for them to learn and thrive and I want them to see the growth potential.” In the end, he admits that for him, it has always paid off to hire that person and move forward. Every person working in the agency including support staff is licensed and most were hand-picked by Rex. Rex says he believes there are two kinds of agents. One builds on relationships and the other goes by the book and the technical facts. Although there is a need and a place for both types of agents in the industry, he is the relationship person. That is also how he hires. He has never advertized for employees. He looks for people with a good work ethic, values and honesty. “You know your community and you know who you would like to associate with and want to work with. I am always looking for people and keep them in the back of my mind,” Rex said. Then when the time comes to add to the agency, he says, “I know the type of person I am looking for and I just go through my rolodex and find the perfect one.” Yes, he calls to recruit them. The business is always evolving and that means change is needed and, as Rex said, “I realized I needed a plan. I thought we better have some direction because of the growth. It was difficult to make a business plan because all I knew was that I was going to work hard until I succeeded. But I knew I needed a real plan.” Erie Insurance helped him with the business plan development and the document still is a dynamic driver for the business. “It’s something we have to look at every couple of years to see if we are doing well, what we should be doing or if we have to make modifications,” Nichols said, but added that other tweaks and changes are made in between the two-year formal review cycle. Time management is also a challenge that doesn’t change. He found that being a referee at high school and college football and basketball games was a stress reliever for him, also demanded time along with work, family and community. He quit when he turned 60 years old, but is proud to have served and been inducted into the Indiana Football Hall of Fame as a referee in 2009. Going back to his purpose for hanging that shingle in July, 1995, he still gets great satisfaction from helping somebody… and likely will for a long time to come. The reason to start a small business can be a very powerful thing. 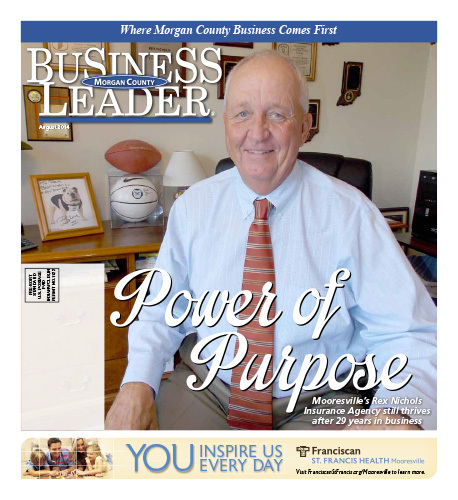 Download the full August 2014 Edition here.